Shortly after my wife and I first moved into our first home together, we created a game room. We had consoles and PCs and a single bed we used as a couch. One of the games we liked to play was The Sims. 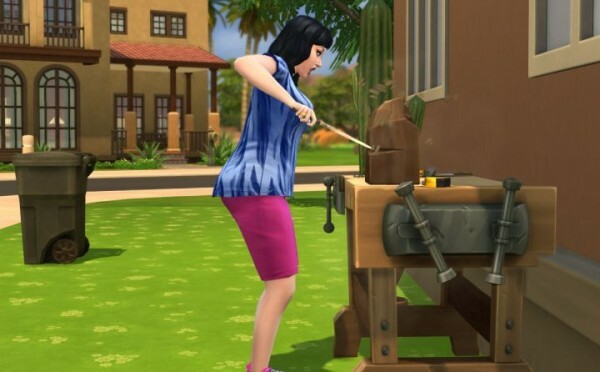 In The Sims: Livin’ Large, there is a “KraftMatic Woodworking Table” where Sims can carve gnomes out of blocks of wood. At first, gnomes might only sell for $1, but as the Sim’s Mechanical skill improves, they will increase in price. One day after my wife and I were sitting there watching a simulated person build something and sell it while we sat watching, a simultaneous ‘light bulb’ went off in our heads when we both realized we could ‘build gnomes’ in real life. We never played The Sims again. My wife started a custom knitting company, became a lactation consultant, and is now selling essential oils and making soap. I started out doing handyman work, started a web design company, and started a career in IT. In high school and college I used to make t-shirts by writing on white t-shirts with red markers. I’d write inside jokes like “Forks, Knives, and Spoons” or movie references like “She’s All That” with a giant arrow pointing to my left. In 2007 I briefly considered starting a t-shirt business before going into web design with Telablue. “The problem I never addressed with you was the fierce pushback I got from my wife as soon as I discussed our plans for her business. That is why I didn’t follow up with the T-shirt idea and switched to Telablue,” I emailed my friend, Jason on 10/19/2007. Jason was one of my friends in high school and throughout our adult lives we’ve maintained our friendship thus far. I’ll get to the ‘t-shirt designer inside him’ later on in this post, but for now let’s keep going with the ‘t-shirt designer inside me’. While sitting at my job at work or driving my daily commute I’d come up with t-shirt ideas and email them to my friends. On 9/28/2010 I had an idea for a “Picture of flux capacitor with ‘Capacity for Change’ written underneath.” Not good. I started designing t-shirts almost as soon as I started learning about computers. This t-shirt blank is from 12/15/1996. I used it to design t-shirts for my local high school church youth group, which we called “SOTE” (Salt of the Earth). Not long after, Jason and I formed the band, Shog, and so ideas for making Shog t-shirts soon followed after. 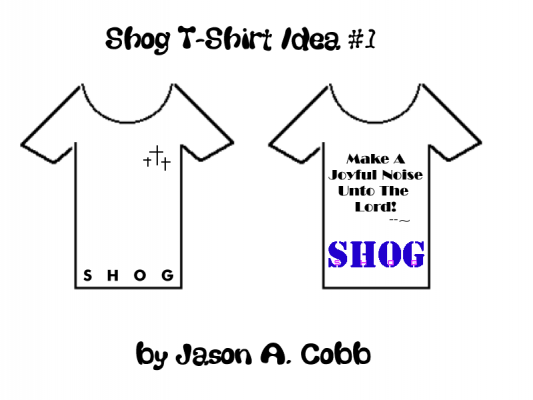 This “Make a Joyful Noise Unto the Lord” Shog t-shirt idea is from 4/7/1997. It was designed by Jason, but never got printed. Jason and I weren’t the only one of our friends to get into the t-shirt design business. My friend Derek, came out with the “Jerk Club” in 12/27/2008. It only had 2 members, who are featured here in this self-deprecating picture below. In 2010 I had the t-shirt design bug again and designed two shirts. 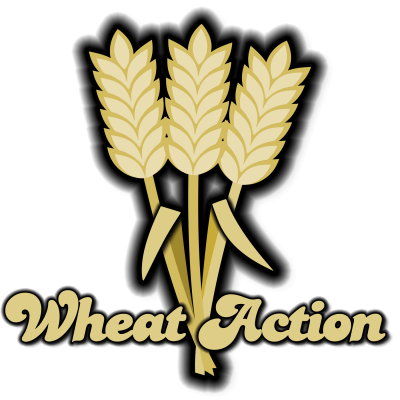 This “Wheat Action” one is Settler’s of Catan inspired and is from 12/12/2010. I actually had this t-shirt printed, but gave it as a present to a friend who played Catan with us. 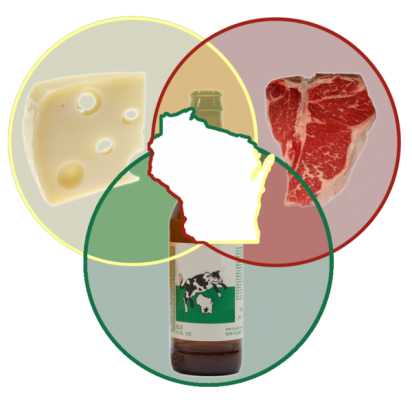 This “Wisconsin Venn” t-shirt idea is from 12/29/2010 and features the state of Wisconsin at the center of a Venn diagram featuring cheese, meat, and beer. 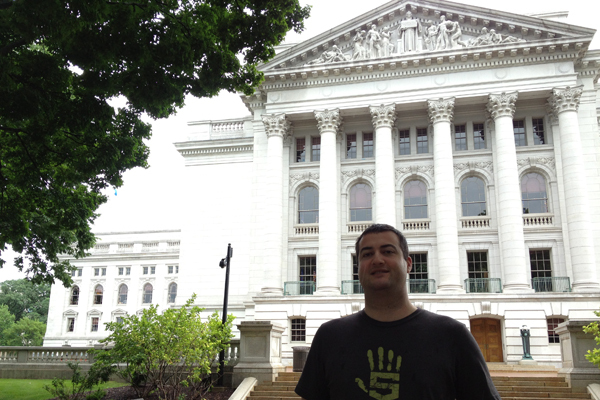 I finally ended up traveling to Wisconsin a couple of years ago with Jason. Fun times. Before I get into Jason’s t-shirt design business, here’s one more t-shirt design from 7/21/2013 titled, “Sandwich Lover”, which was never printed. I do love sandwiches and have often played with the idea of starting a sandwich blog, but have not. 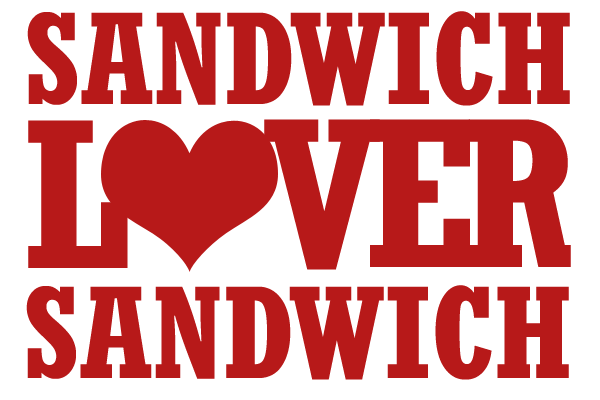 1/2/2016 UPDATE: This “Sandwich Lovers Sandwich” t-shirt is now available on Amazon. Activity – Set goals and meet them. Make things better. Smile. Explore. Take time to enjoy life. Community – Organizing. Lending support. Knowing your neighbors. Believing in each other. Truth – Serve people. Be true. Hope. Refreshment. Be Positive – Peace. Expect the best. Be cheerful. Glass half full – of awesome stuff. Beauty – Stars. Sky. Sunrise Sunset. Smile. Kids’ laughing. The trail. In a lot of ways, High5 was a reflection of Jason’s values. He likes to set goals and smile. He knows his neighbors. He serves other people. He loves his family, takes them to watch the stars at night, and walks with them on the trail through life. What Did Jason Learn from High5? 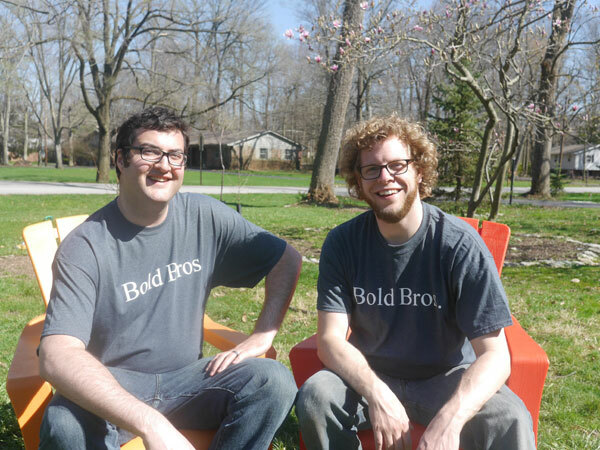 Despite getting accepted into Cotton Bureau, he couldn’t garner the necessary votes to get them to go to print, but he did end up printing them locally in Indianapolis and sold them on his own Shopify ecommerce store. “The amount of effort to get true good quality from a printing partner is remarkable – as I’ve been able to re-confirm with Sycamore,” which is Jason’s latest business on bible print art for the modern home. 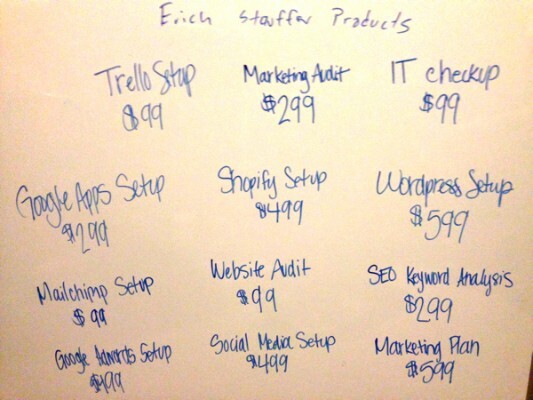 On a whiteboard in my office I wrote all of the products-as-a-service I could think of to sell and some possible prices. Pricing was based on previous jobs I had done as a consultant. The key would be to be as clear as possible about what I was doing and what they were getting in order to make sure both sides understood and were in agreement. I decided not to release all of the products at once, but instead to release them one at a time. But after some thought, I offered the following idea. After all, I was seeking counsel and I would be a fool if I didn’t at least consider the input from those who were offering to help. “What do you think about the Managing Actions name?” That was a domain I registered in 2008 and a lot of the blog posts on this site originally came from. This wasn’t the first time I had tried to start something else using managingactions.com. In 2010 I created Action Management, a management consulting service specializing in business process management and staffing models, but I didn’t take it seriously (although the idea did help get me an 8 month contract that helped save a business). This time would be different. I had set managingactions.com to not renew in July, but it already had WordPress installed on it. I changed it back to autorenew and put up a new Genesis theme. 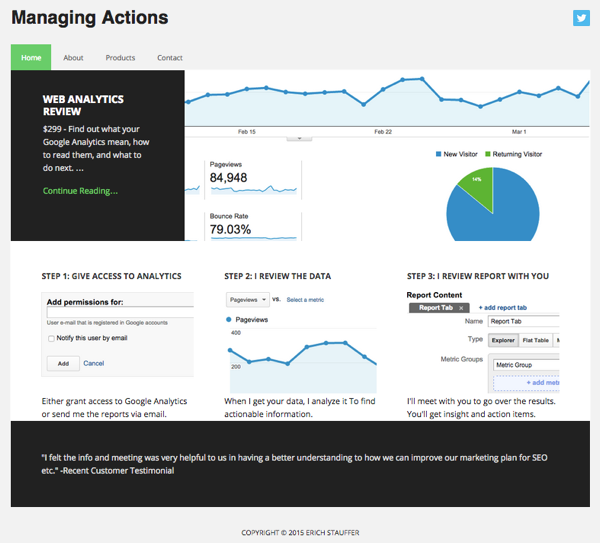 I then created a homepage that explained the first product, “Web Analytics Review”. It had graphics explaining the how the product worked (i.e. 1. Give access to analytics. 2. I review. 3. Meet and go over.). I then added a testimonial from a client who had purchased the product the week before. I already had sold the product so I knew I could do it again. I’d like to use the products as an inroad to do more marketing consulting, starting with looking at analytics but then getting into a review of marketing processes, management of marketers; helping business owners setup processes for creating and managing content (i.e. either using a content management system like Compendium, Hubspot, or Eloqua; or by simply creating editorial and promotional calendars and then using a service like Bufferapp or Hootsuite to manage it). One challenge is that I still have my day-job and I don’t want to jeopardize that. I count on that money and I like my job. That means I can’t use LinkedIn as a platform, but I can use Google Ads or other under-the-radar things. So far I’ve setup a Twitter account and posted it out on my personal Google+ page, but I haven’t gone farther than that. I won’t be able to setup an Instagram account because I already had one under that name and deleted it, but that’s okay. Instagram probably isn’t the best channel for web analytics review marketing. Sean Wes has a technique called “The Overlap Technique” (http://seanwes.com/book/) that talks about building up a business on the side while holding down a day job. That’s the approach I’d like to take. One of my goals for 2015 is to “do what I tell my customers to do” and those things are: blog, podcast, and create videos. So far I’ve been blogging, and I’ve lined up a podcast co-host, but I haven’t made any podcasts or videos yet. One other option is to record videos and/or podcasts in the car while driving using my iPhone. What I’ve lacked is a reason. Now I think I have one.